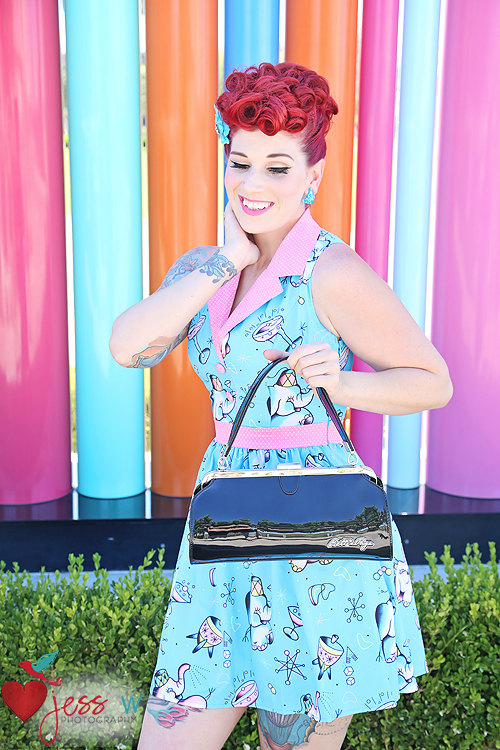 The Sourpuss Pink Elephants June dress Is such an adorable dress. The vintage style print is perfection, featuring Drunken elephants by artist Mimsy Gleeson. The mini length is wonderful for beating the summer heat, landing mid thigh. (I am 5’6″ for reference) The fabric is super comfy, soft and flowy with a bit of stretch too! The cute pink polka dotted waist band provides a break in the fabric and creates a belted look which gives a very flattering shape. The matching lapel collar adds to the vintage feel and gives the design such a cute contrast! The neckline is a lowcut V line followed by two pink polka dot fabric covered faux buttons. Such a cute added touch right? The back of the dress is seamless. Closure is a side zip. This dress became a fast favorite for certain. I can spend a hot summer day in comfort and cuteness! Did you notice that cute bag I’m holding up there? The sourpuss Bettie Page cover girl purse in black pairs perfectly with just about any outfit. Definitely a staple piece. Who doesn’t get a ton of use out of a black bag? The glossy vinyl makes it easy to pair with a dressy evening or a casual day look. Make sure to check out www.sourpussclothing.com for a large selection of clothing, (for the guys and little ones too) accessories, and housewares! Check their “What’s new” section for newly stocked items. The Pigtails and Pirates Girl Power Power of 3 in blue sweetheart style dress was just screaming my name. If you know me, you know I am a DC comics nerd. <3 My nerdy little heart was in love at first sight. Of course My very favorite thing about this dress is the unique and super rad print, but Next in line is definitely the beautiful cut. The Neckline of this dress is just perfect. The sweetheart cut gives plenty of room for the bust and creates a flattering shape with the slight v at the center. (helps give some great cleavage too. hee hee) The straps are thick and sturdy with a great shape that really compliments the neckline. I absolutely love the waist of the dress as well. The fact that the super girl symbol sits right in the middle of the band gives it a fun superhero style belted finish. The flared skirt has plenty of room for twirling and a petticoat! The length is great, landing in the middle of the knee with a petticoat. I am 5’6″ for reference. The dress closure is a hidden back zip. I had to break out some comic books for this shoot, and of course they are superman. 😉 This dress just puts me in a good mood. Make sure to check out all of the amazing novelty prints Pigtails and Pirates has in their dresses, skirts and playsuits for ladies. You will fall in love. There is definitely something for everyone. They also carry adorable shorts for boys, an array of clothing for little girls, and even rompers for infants! Have something extra special in mind? They also take custom orders! The Anchor Swimsuit in Red and white stripes from AngryYoungAndPoor.com is an adorable sailor inspired suit. It is a tankini cut with navy bottoms attached making it a super comfy one piece. The suit features adorable Anchor buttons down the front center of the suit as well as on the faux pockets. Here is a closer view of the anchor buttons and faux pockets. You can also see the super cute navy tie up bow in the center of the V cut bust. All of the little details really make this suit, don’t you think? The back of the suit is red and white striped with white piping down the the back on both sides which creates a break in the striped pattern and contributes to a flattering shape. The halterneck tie makes the suit easy to adjust, being able to tie it tightly or loosely gives plenty of flexibility for the bust. Beat the heat the whole month of June with this super special. The Sun Bathing beauty Mini special is just $130.00 and includes professional hair & makeup plus 3 retouched images with release to print! Our Tiki bar Set is making it’s Las Vegas Debut this summer. Take advantage of this cute set while it is available. Offering Mini sessions in June and July $175 Includes professional Hair & makeup and 5 fully retouched images with release to print! The Sally Classic Vintage Sailor Dress in Yellow by Dolly and Dotty is a playful retro sailor style dress. The bright yellow color and white polka dots will have you feeling bright and cheery the moment you see it. The Sally dress is made with 95% cotton, 5% elastane So it is light weight, comfortable, and has a bit of stretch. Featuring an adorable white collar which comes together in the center as a darling tied bow! The bust features bottom pleats, which are in the perfect place to create a very flattering shape. The fitted empire waistband creates an elegant silhouette. The built in tie belt in matching fabric gives the dress a nice finished look and can be tied in the front of the dress or the back which creates two different looks. The skirt on the Sally dress is flared with flattering box pleats. The length of the dress lands just above the knee. Perfect for a warm day. The Sally dress fastens with a hidden zip at the side. So the back of the dress is seamless. Which are my other top favorites. You really can’t go wrong with this playful dress design it is one of those dresses you will want to own in every color! This dress is available in UK sizes 6-24. Make sure to Check out Dolly and Dotty’s New in section as well for an array of fabulous newly released vintage style clothing!